I lean my face toward the beech branch and set off a Rio Carnival of dancing insects. Each tiny aphid is dwarfed by the white plumes that arch from the rear of its abdomen. They don’t samba, but they do shake their tail-feathers, pulsing in a loosely coordinated dance as they shuffle along the branch. From a distance the massed white has a creepy air, like the heartbeat of a blighted, molded animal; from closer, the aphids look like flecks of possessed, animated candy floss. It is only the larger aphids that are adorned in this way. Smaller ones are gathered in a crèche where they squirm their pallid bodies over each other, snuggling into the mass as the larger insects walk over them. Under the twig, this mass swells and a light poke from my pencil reveals — it is hard to say what — a blob, a flattened jellybean, an unformed lump of the same pallid insect flesh. These odd creatures are beech aphids, Grylloprociphilus imbricator, sometimes called “beech blight aphids” (although they are not a fungal blight) or boogie-woogie aphids (although their left hand piano shuffle is not up to par). Their dance is a defensive warning: insects that amble into the colony will be jabbed by the piercing mouthparts of the older aphids. They are too weak to hurt humans or other large animals, but the creepy-looking dance is enough to make most creatures hesitate for a moment. Any mammal or bird that ignores the warning and takes a bite will get a mouthful of tangling wax as the plumes on the insects’ backs break away. I tongued one or two and can report no apparent defensive chemicals, although who knows what my taste buds missed. The colony is comprised entirely of clones. A foundress — the blob that was so well hidden in the squirming mass — picked this twig weeks ago and started giving birth to little aphids, genetic clones of herself. The young female aphids feed, grow and defend the colony. Later, some of these offspring will mature into winged forms (alates) that disperse and found new colonies, again reproducing asexually. Then in the fall, some males will be produced allowing a little genetic mixing before the winter. This species is widely distributed and are quite often encountered in yards. Yet details of its life history are, as far as my literature searches can tell me, mostly undescribed: When does the switch to sexual reproduction happen? How does the foundress feed or is she fed by her kids? How and where do they overwinter? How many asexual generations are completed within a year? What kinds of predators and parasites plague the colonies? Some the species’ close kin (other wooly and gall-forming insects in the subfamily Eriosomatinae of the Aphididae) have ant-like life histories, forming solider castes within the colony. Grylloprociphilus seems less specialized, but without detailed life history studies, we can’t say more. Aphids feed by using their sharp mouthparts to sup on the sweet phloem sap of plants. This sugar-laden juice is poor in protein, so they have to process a lot of sap to get their dinner. The insects discard excess sugar, coating the leaves and ground below the colony with sticky “honeydew.” This makes the colony quite a hub of activity. As I watched, at least four species of hover fly and one species of fruit fly visited the leaves to feed on the sweetness. And a fungus species, Scorias spongiosa, specializes on the honeydew of the beech aphid, growing nowhere else. So as the carnival passes, candy gets thrown to the crowd. Syrphid fly, “hover” or “flower” fly. One of several that visited the colony. 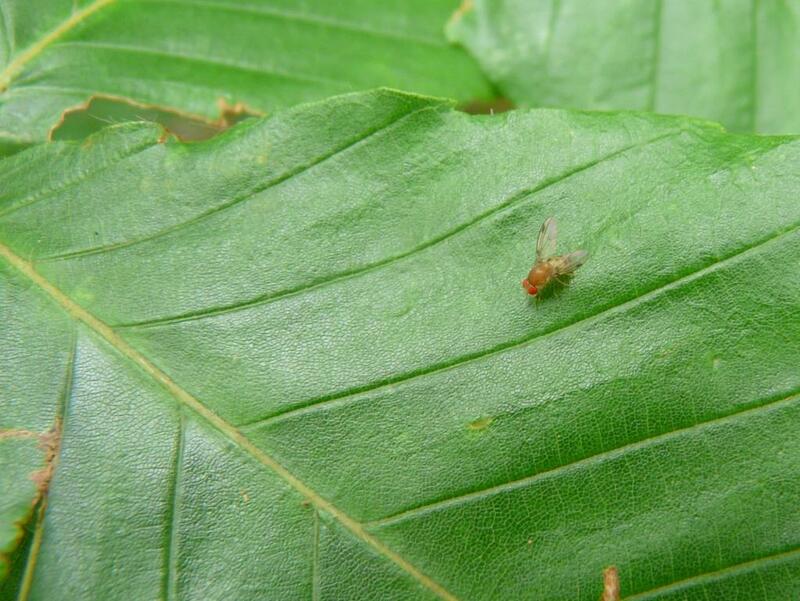 Tiny red-eyed Tephritid fly or “fruit fly,” slurping on honeydew. This entry was posted in Trees on August 4, 2013 by David George Haskell. Thanks, David. I have noticed those little boogie-woogie bugs and long wondered. Now I know! 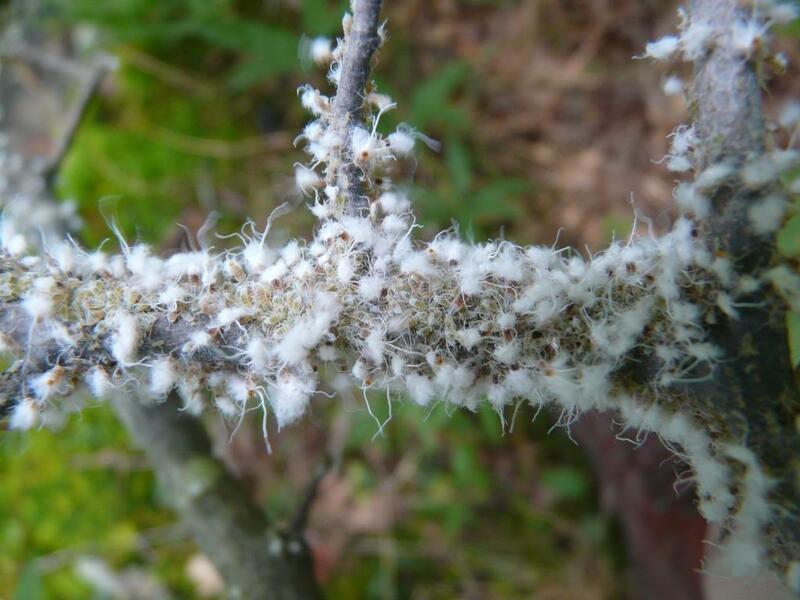 I wonder how closely they are related to the ‘wooly’ aphids that can infest and actually kill apple trees? I’ve only seen them on branches but the literature says they can infest the roots and kill the tree. The wool from these little monsters might be waxy but also wet, somehow. The wooly aphids (Eriosomatinae) bunch up and don’t really move or dance. If you wipe them off the branch (if you leave them they can kill it) they leave behind a purple smear. I haven’t tongued any yet, but If you’d like we could sample a couple. Same subfamily, so the wax is likely very similar. The apple wooly aphid has a similar life-cycle, reproducing mostly asexually. I think they also alternate onto other hosts like elm. Wonderful descriptions! I had my mathematically-minded son do a little aphid math this spring. They are amazing creatures! Now I know I’m not the only one who has tasted aphids — on purpose, that is. Thank you! Was the math about exponential growth? Asexual cloning lets them *explode*. 62 million is a lot of food for some lucky predator…! Thank you! I’m very happy to hear that you’re enjoying the book. I was similarly captivated by these aphids back in late summer of 2008 in Lewis County, TN. 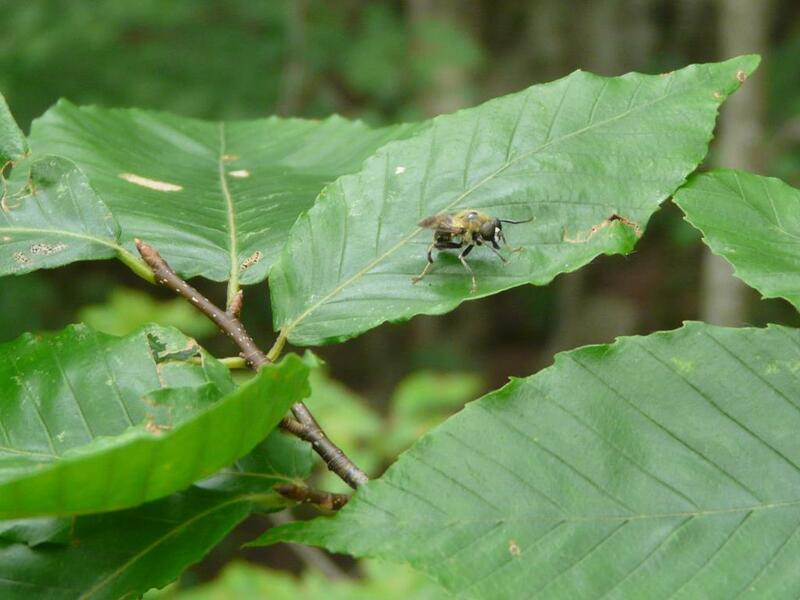 As I and two coworkers marveled at their strangeness two of us were stung by… I never saw what. I suspected that yellow jackets were the culprit. I also wondered if they were defending the sweet exudate of the aphids. Pain is an efficient teacher and I am still leery of beech trees with low hanging branches. A nest may have been nearby and the leeriness would be founded on coincidence. I was disinclined to investigate further so the mystery remains. …so many stingers out there. Oh yes, I ran into a patch of deadfall leaves in the forest yesterday at my friends. The ground below an oak sapling appeared bluish. Curiosity got the best of me, and I bent down to inspect the blue color on the ground. Instead, I almost made a nose dive into the middle of a nest of those aphids attached to the limb of the very sapling . 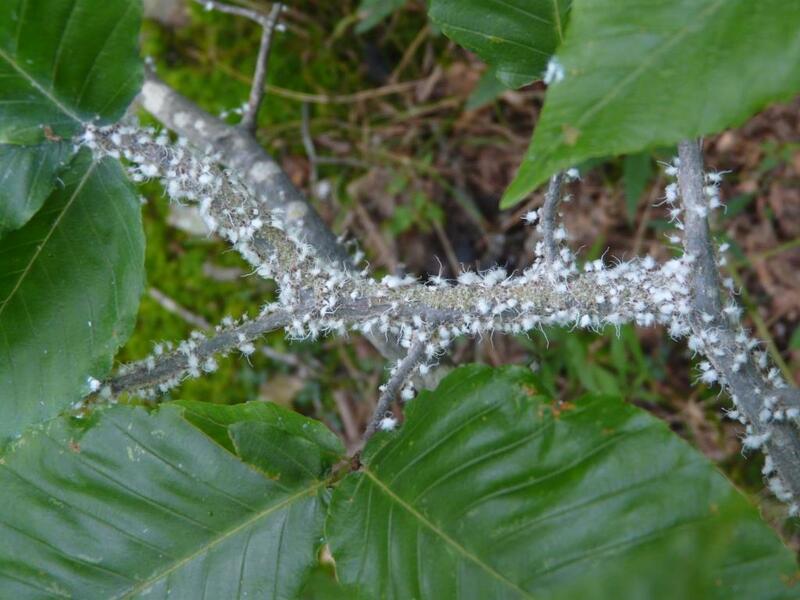 The brach was completely coated with them. A rather vulgar, Iorgiastic writhing did begin on that limb. I believe I turned and fled the scene. Even in the gross therein too lies a peculiar beauty.